Click here to read article about aquifer recharge and recovery programs. 2004 - Analysis of Water Banks in the Western States. Washington Dept. of Ecology. 2005 - The One-Dam Solution. Living Rivers. 2007 - Artificial Recharge: A Multi-purpose Water Management Tool. Arroyo. Water Resources Research Center. 2007 - Semitropic Stored Water and Recovery Unit. Bureau of Reclamation. 2008 - Prospects for Managed Underground Storage of Recoverable Water. National Research Council. 2008 - Aquifer Recharge, Storage and Recovery. Southwest Hydrology. 2008 - Conjunctive Use Technical Memo. Southern Nevada Water Authority. 2009 -Successful application of Managed Aquifer Recharge in the improvement of the water resources management of semi-arid regions: Examples from Arizona and the Southwestern U.S.A. Lluria. 1963 - Pacific Southwest Water Plan. Department of the Interior. 1964 - Pacific Southwest Water Plan. Department of the Interior. 1946 - A national menace becomes a natural resource. Bureau of Reclamation. 1949 - US House Hearings of the Upper Basin Compact of 1948. 1969 - Dam site investigations for the upper basin. Bureau of Reclamation. 1971 - Upper Colorado River comprehensive framework study. Water Resources Council. Dolores River & San Juan Framework. Colorado Water Conservation Board. 1960 - Ecological Studies of Flaming Gorge Basin. Flowers. 2007 - Uinta/Green River Conceptual Water Development Projects.CH2MHill. 1982 - Impact of reservoir development in the Yampa River Basin. Veenhuis and Hillier. US Geological Survey. 2008 - Lower Dushene River Wetlands Mitigation Project. 1985 - Four Corners: A National Sacrifice Area? 1965 - Lake Powell: Jewel of the Colorado. Department of the Interior. 1968 - Congressional hearing in January & February, Part2. Lower Colorado River Studies. US Geological Survey resource web page. 1971 - Lower Colorado River comprehensive framework study; App. V; App. X; App. XI;. Water Resources Council. 2006 - Wellton Mohawk FEIS. USBR. 2013 - Salton Sea Final EIS/EIR. California. 2014 - Hazards Toll: The Costs of Inaction at the Salton Sea. Cohen et al. 2016 - The Salton Sea Special Report. Sierra Club. 2017 - State of the SaltonSea. USGS. 2000 - Two Nations One River: Ecosystem Conservationat the Delta. Pitt. 1928 - The Colorado River Question: Shall Natural Resources Create Local or Enlarge Distant Development. State of Arizona. 1990 - Agency recalcitrance and evasion regarding compliance with NEPA relating to Glen Canyon Dam operations: A documented need for congressional intervention. Lippman. 1997 - Congressional hearing on Sierra Club's proposal to drain Lake Powell. 2000 - Looking toward the future: The time has come to restore Glen Canyon. Wegner. 2000 - Decommissing Glen Canyon Dam: The key to Colorado River ecosystem restoration and recovery of endangered species. Carothers and House. 2000 - The proposed draining of Lake Powell an inequitable taking of upper Colorado River basin states rights. Christensen. 2003 - Conflict and Cooperation: A case study of Metropolitan Water District. Zetland. 2004 - The dam controversy: Does the Endangered Species Act apply internationally to protect foreign species harmed by dams on the Colorado River? Kellogg. 2008 - Beyond conjecture: Learning about ecosystem management from Glen Canyon Dam experiment. Camacho. 2008 - Collaborative management of Glen Canyon Dam: The elevation of social engineering over law. Feller. 2007 - The Colorado River: The story of a quest for certainty on a diminishing river. Kuhn. 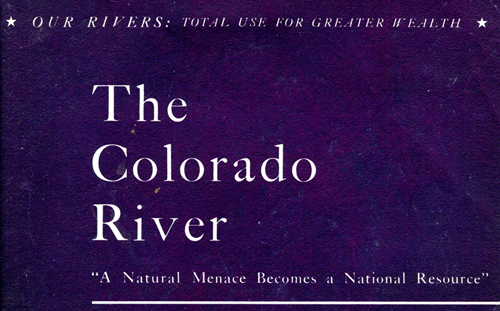 2007 - The Colorado: A River at Risk; Coping With Drought. GCT. 2011 - Thinking Like a River Basin. Carpe Diem. 2011 - Watering The Sun Corridor: Managing Choices In Arizona. Morrison Institute. 2011 - Draft: Risk Management Strategies for the Upper Colorado River Basin. Kuhn. 2014 - Research Needs in the Colorado River Basin. Colorado River Goverance Initiative. 2016 - Joint West Slope Basin Roundtable Risk Study. (Update). Kuhn. 2016 - Survey Results: Colorado River Water Users Association. Berggren. 2015, December - A Look At Interim Guidelines at Mid-Point: How Are We Doing? 1970 - Glen Canyon Dam technical record of design and construction. Bureau of Reclamation. 1975 - Scientific information in the decisicion to dam Glen Canyon. Lake Powell Research Project Bulletin #9. 1990 - Colorado River ecology and dam management. National Research Council. 1994 - Review: Glen Canyon Dam long-term monitoring plan. National Research Council. 1996 - Review: River Resource Management in the Grand Canyon. National Research Council. 1999 - Review: Glen Canyon Dam adaptive management program. National Research Council. 1936 - Construction of Boulder (Hoover) Dam. Bureau of Reclamation. 2006 - Hoover Dam. Bureau of Reclamation. Regional Watershed Supply Project (Million Pipeline). Army Corps. Green River Pumping Project EA. Reclamation. 2007 - Risk Assessment: Temperature Control Device. Valdez et al. 2007 - LTEP workshop. US Geological Survey. 2008 - Comments on BHBF (experimental flood). National Park Service. 2009 - Development of high test flow protocols. Federal Notice. 2010 - Work Plan and Budget for 2010 & 2011. GCMRC. 2009 - Prosperity without growth. Sustainable Development Commission. 2012 - Freshwater Use in USA by Power Plants. UCS. 1960 - Audit of the Colorado River Storage Project. GAO. 1977 - The Drought of 1977. GAO. 1983 - Colorado River Flooding in 1983. GAO. 1996 - Audit of the Glen Canyon Dam Enviromental Impact Statement. GAO. 2010 - Energy Water Nexus: Oil Shale. GAO. 2018- Oil and Gas Wells: BLM needs to imrove its data and oversight of its potential liabilities. GAO.